> layout that's been labeled The Valley Temple . •	Mortuary Temple lacked the final granite casing and some rooms were only outlined. •	Causeway and Valley Temple were barely started. •	Pyramid was finished and cased, but the casing was not finely finished. •	Enclosure Wall and pavement around the pyramid were not started. •	One subsidiary pyramid was complete while the other two were in the form of step pyramids. •	The substructure of one subsidiary pyramid was incomplete. •	Only one of the three subsidiary pyramid temple foundations was laid. Menkaure’s son and successor, Shepseskaf, used mud brick to complete the Mortuary and Valley Temples, all of the subsidiary pyramid temples, the Causeway, and probably the Enclosure Wall. A stele found in eight pieces in the portico of Menkaure’s Mortuary Temple…provides proof of both the order of these two Dynasty IV kings as well as their relationship and some evidence that Shepseskaf completed his father’s complex up to three years after Menkaure’s death. It is possible that the work necessary for the burial was completed during the time Menkaure was dying and his body was being prepared. This would include finishing the granite casing around the pyramid entrance and the Mortuary Temple, and using mud brick to at least preliminarily complete the Valley Temple and Causeway…” Pyramids of the Giza Plateau, page 187, Charles Rigano. 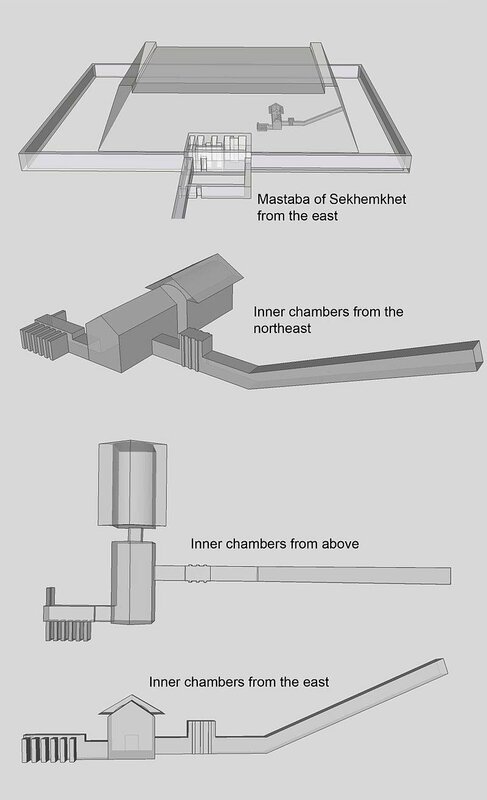 It is also important to remember that all of the work Shepseskaf completed on Menkaure’s Pyramid Complex was achieved in the four (4) short years he ruled, while he simultaneously constructed his own mastaba tomb.